Trashiyangtse is in the eastern most part of Bhutan. The main town is a new urban area still with the strong touch of rural atmosphere just as the villages that surround it. It has the newest dzong in the country, built in 1997. The old dzong, founded by Pema Lingpa in early 16th century, lies further south of the town. Trashiyangtse is famous for its handcrafted wooden cups and bowls. Standing serenely by the river is a stupa, the sample for which was brought from the Boudhnath in Nepal. It was built in 1740 by Lama Ngawang Loday for the benefit of the people of the valley who wished to travel to Boudhnath but could not go and for the fact that the people of the valley were very devoted Buddhist. It is said that the sample was carved on a radish, which shrunk by the time it reached Trashiyangtse, and there fore, the stupa is not as large as the one in Nepal. During the second month of lunar calendar there is a lively festival called the Kora or circumambulation. Just as the art school in Thimphu, students are taught the traditional skills and art of Bhutan. In addition to what is taught in Thimphu, this school’s curriculum also includes gold and silversmithing, wooden bowl making, traditional tailoring and embroidery. More over the students are offered various courses in Dzongkha and English to complement their craft trainings. 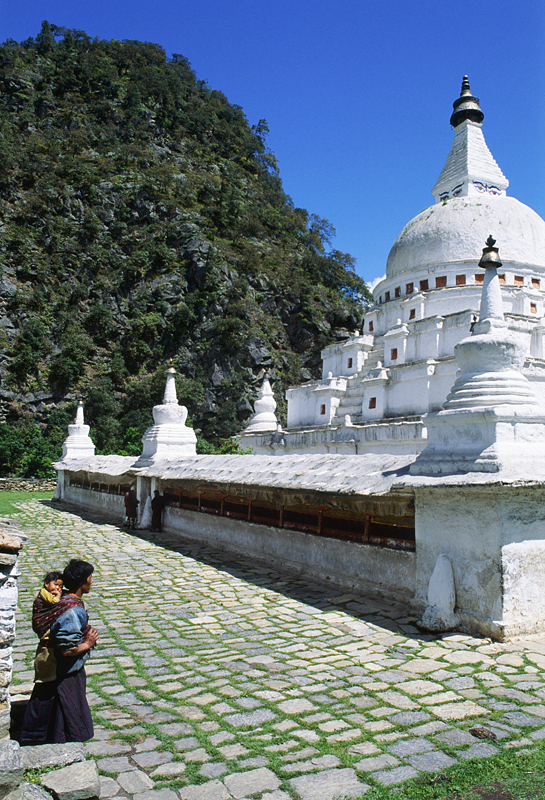 About one hour walk from Chorten Kora, Bomdeling is also a winter resting place of a flock of black-necked cranes. The village is also popular for traditional handmade papers made from locally found Daphne plants. Paper was one of the commodities highly demanded by Tibetans in the old trading days.